60532 at ICI Wilton on the 19-8-92. R Pearson. 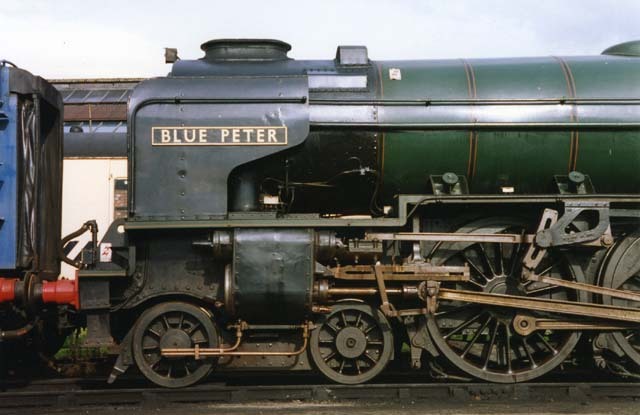 60532 Blue Peter is the sole survivor of 15 A2 class locomotives designed by Arthur H Peppercorn of the LNER. The locomotive was out shopped by the newly formed British Railways on the 25th March 1948, painted in apple-green of the old LNER but numbered 60532 with 'British Railways' on its tender sides. It was initially allocated to the North Eastern Region of BR at York where it worked principally over the east coast main line. In the autumn of 1949, after an overhaul at Doncaster, where a number of modifications were made, including the fitting of a multiple valve regulator and a double blast pipe and chimney, together with kylchap cowls. 60532 was transferred to work in Scotland where it was allocated to Aberdeen, primarily employed on Glasgow and Edinburgh expresses. During steaming trials in 1951 between the single and double chimney A2s, 60532 achieved 100mph on the 'The Aberdonian' between Stonehaven and Montrose. Towards the end of its BR career the locomotive was allocated to Dundee and became the last Peppercorn Pacific to be overhauled at Darlington Works. In 1966 the locomotive was frequently requested for rail tours that saw it work as far a field as Holyhead and Exeter. Its final rail tour in October 1966 was over the Waverley route and the west coast main line over Beattock. 60532 was withdrawn from service on the 31st December 1966 and put into store. Blue Peter was purchased for preservation in 1968 by Geoff Drury and with the involvement of the children's BBC TV programme of the same name, was restored to working condition once more. Restoration was undertaken at York, Leeds and Doncaster Works where it was repainted in LNER apple-green livery as No 532. 60,000 people witnessed its renaming by the BBC Blue Peter programme presenters at a Doncaster Works Open Day in 1971. Unfortunately Blue Peter did little work until, in the late 1980s, Mr Drury and NELPG reached an agreement for the group to restore the locomotive to main line condition. Restoration to BR livery as 60532 was carried out with much assistance from ICI Wilton and thousands of NELPG man hours. 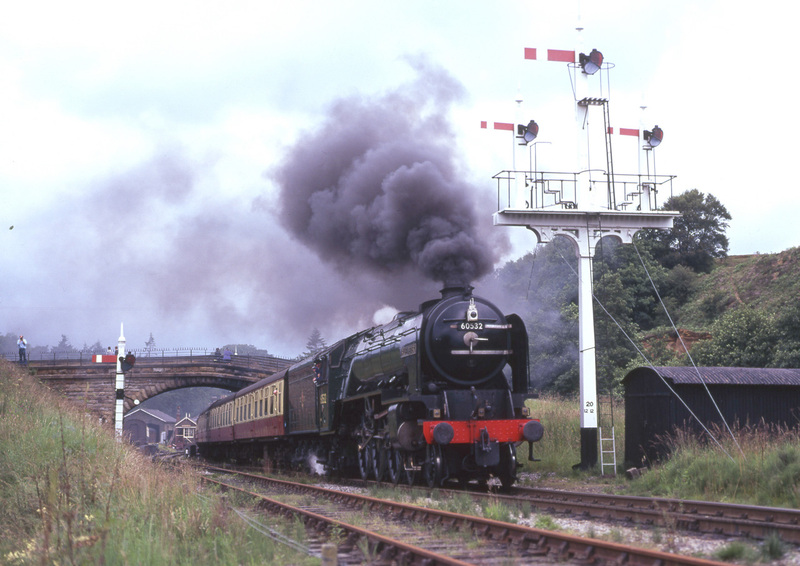 The A2 was renamed by the BBC Blue Peter programme for a second time in December 1991, shortly after which the locomotive was moved to the NYMR for running in. 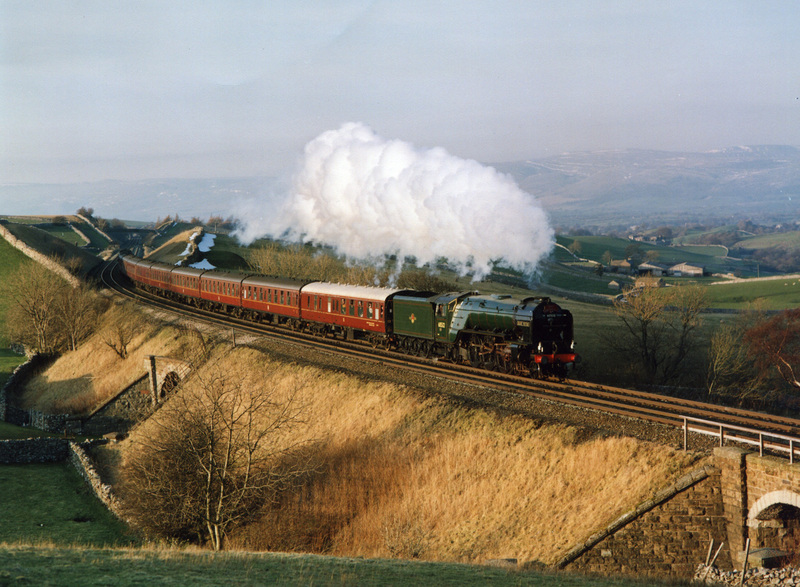 Early in 1992 the locomotive obtained its main line certificate and then worked many rail tours over the Settle and Carlisle, and as far north as Aberdeen. 60532 approaches Birkett Common on the Settle to Carlisle Railway on the 6-3-93. D. Whitfield. During this time the locomotive worked very well and soon earned a reputation as a strong, reliable performer amongst footplate crews and passengers alike. However, on the 1st October 1994, whilst working a tour from Edinburgh to York the locomotive suffered a major mechanical failure, caused by a prolonged uncontrolled wheel slip on departure from Durham Station. During the slip both outside sets of valve gear were destroyed, the leading coupling rods were bent, all coupled wheel axle boxes were damaged and the left leading driving wheel moved on its axle. Following the removal of the damaged valve gear the locomotive was hauled to Thornaby MPD, where NELPG volunteers carried out the extensive repairs necessary. One of the most difficult tasks required to effect the repair was the removal and refitting of the slipped wheel from its axle. A country-wide search for a wheel press capable of removing the 6'2" wheel from the crank axle eventually revealed the existence of a suitable device at the then British Steel fitting shops, Redcar (just 10 miles from the locomotive). The repair work took 18 months to complete and following a period of running in on the NYMR the locomotive resumed its mainline career in November 1996, working a charter from Middlesbrough to Skipton via Newcastle and Carlisle. During the winter of 1998 the locomotive was given an intermediate overhaul, including the replacement of all small tubes. This permitted an internal examination of the boiler to be undertaken, which in turn allowed an extension of the locomotive's mainline certificate to be obtained. During its period of mainline running with NELPG Blue Peter covered vast areas of the mainline network and visited many private railways. Perhaps its most notable achievement was to work the Blue Peter programme 40th Anniversary Special from Edinburgh to London Kings Cross in April 1998. The whole journey was recorded by the BBC who devoted a full Blue Peter programme to the event. Blue Peter's mainline certificate expired in September 2001. 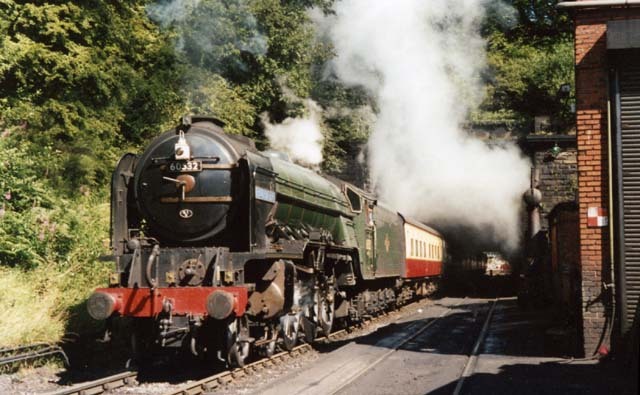 The locomotive was based upon the NYMR at the time and remained in service on that railway until the end of the 2002 season. 60532 leaves the tunnel at Grosmont on the NYMR with a train for Pickering. R Pearson. 60532 leaves Goathland on 26-7-97. Colin Smith. Before the locomotive can work again a full major overhaul, including extensive boiler repair work, is required. The total cost of the overhaul is estimated to be in the region of £500,000. 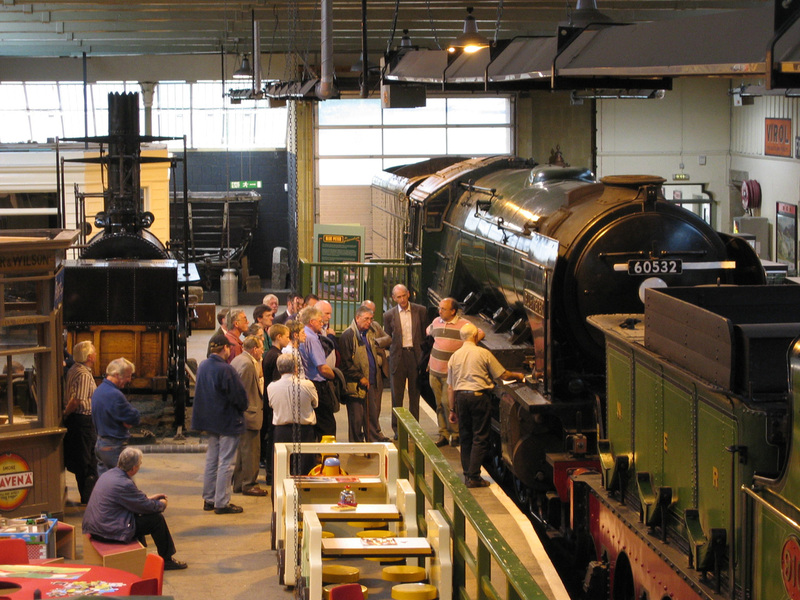 For the time being the locomotive resides at Barrow Hill Roundhouse where it remains as a popular attraction. It is hoped that positive news on the possible restoration of the locomotive can be announced soon. During an open evening 60532 can be seen in the museum at Darlington alongside George Stephenson world famous "Locomotion No.1". R Pearson. Blue Peter at Carlisle Upperby depot on the 1-8-93. R Pearson. All the 15 A2s were named, the majority of them following the LNER tradition of using the names of famous racehorses. In this case it was the name of the 1939 Derby winner owned by Lord Rosebury. In that year, whilst winning The Derby and other races including the 2000 Guineas, the horse earned almost £32,000 for its owner, more than enough to purchase three Doncaster Pacific locomotives at the time. The locomotive weighs over 161 tons in working order and is over 71 feet in length. The wheel arrangement is 4-6-2 and the 6'2" driving wheels are driven by three cylinders with valve events being controlled by Walschaerts valve gear. The working boiler pressure is 250 psi and the tractive effort 40,430lb.